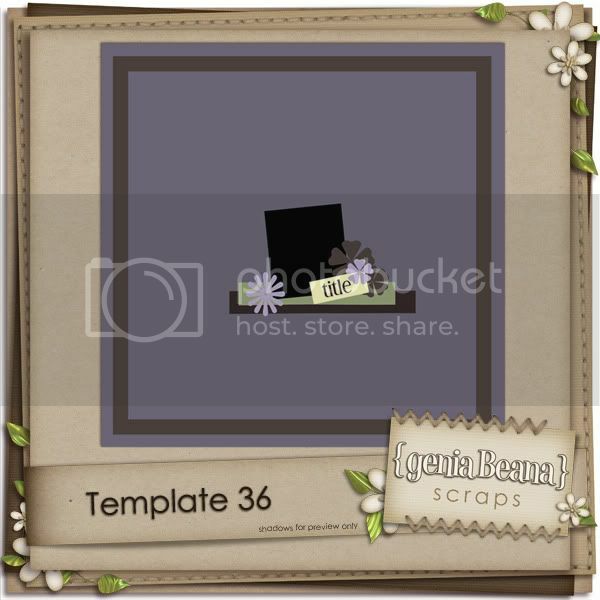 geniaBeana Scraps: A Sneaky Peek and a New Look! I've got a sweet little kit coming soon to my shoppes at GDS and Elemental Scraps. I am in LOVE with it, too. It's peaceful and dreamy and has just enough sparkle. If you'll notice my blog's new look, you'll get a little more of a peek at what is inside the new kit ;) I am SO SO SO excited to have finally taken the time to dress my blog up. I have been meaning to for months and months. Now it's so pretty and I'm wondering why I didn't take the time to do it sooner. To celebrate the blog's new look I've got a little template to share. I hope ya'll enjoy the template. Be sure to check back for the reveal and another freebie on Sunday. Thank you so much for this Freebie. I want to let you know that I posted a link to your blog in CBH Digital Scrapbooking Freebies, under the Page 8 post on Dec. 04, 2009. Thanks again. Thank you! Your blog post will be advertised on the DigiFree Digital Scrapbooking Freebie search engine today (look for timestamp: 04 Dec [LA 02:00pm, NY 05:00pm, UK 10:00pm] - 05 Dec [OZ 09:00am]). Thanks for the template! And the blog looks great! Love the blog look! I'm partial to purples. LOL Thanks for the new template! Oh I like your new blog very much :) Gorgeous!